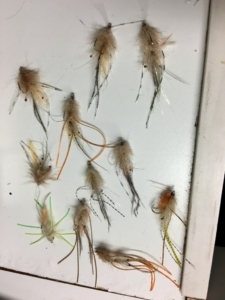 It’s a shrimp invasion !….they will be in salt water at some point in 2019 ! The Muskegon river fishing report is about the mid January “deep freeze” we’re about to enter with some bitter cold weather coming our way this weekend. With low temperatures in the single digits or below zero, the river could be rather quiet for a few days as fish try to acclimate to what will arguably be, the coldest water temperatures they’ve seen this winter. Click HERE for up to date weather forecast for the Muskegon area and greater west Michigan. Hence it’s the time for some winter trade shows, tying flies for those who find themselves at a vise this winter and maybe some warmer climate destination trips to fish in warm breezes and sun ! Once this weather pattern passes and we get into some warmer weather next week, fish will resume their winter behavior and certainly feed at times, but fewer meals and further in between will be their pattern for a while. Present water flows are a bit low, in the 1600 cfs range and with water temperature around 34 degrees. Click HERE for current water flow data on the Muskegon river.